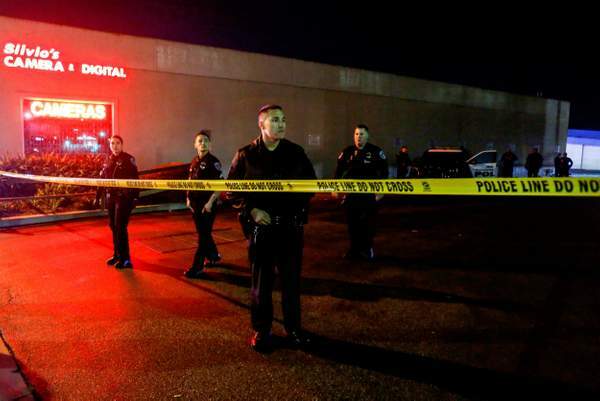 A mass shooting at a California bowling alley which has left three men dead and four more injured. Police in Torrance confirmed shots had rang out at Gable House Bowl. They found seven men with gunshot wounds and pronounced three dead at the scene. According to witnesses a fight inside the bar escalated which led to the shooting. Wes Hamad, a 29-year-old Torrance resident, was at the bowling alley with his 13-year-old niece and cousin when what he called a “huge fight” broke out. A journalist for the LA Times reported a man told him their 31-year-old brother had been shot in the chest while celebrating a birthday at the scene. Witness D Ryon Thomas posted horrific video on Facebook in the aftermath of the shooting which showed one bloodied victim lying on the floor of the bowling alley. Audio of police officers discussing the shooting detailed them calling it a “major incident”. They spoke of “multiple callers”, “multiple people shot” and “gunshot wounds”. An officer also said there had been a shooting in the parking lot and three people were said to be “hiding in the bathroom”. Gable House Bowl patron Jesus Perez told the Los Angeles Times: “We just ran right into the bar and took cover. All we heard was just, like two people got shot,” he told the newspaper. An LA Times journalist shared videos of people weeping outside the alley, with one shouting “we’re here” as they embraced another. Police urged people to “stay away from the area” near the bowling alley. The bowling alley is based on Hawthorne Boulevard, with people warned away from there and nearby Sepulveda Boulevard in particular. A woman living near to the bowling alley, writing on Twitter, said: “I live in Redondo Beach & drive by Gable House all the time. It’s been there since I was a child. Two of the four injured men were taken to hospital while the other pair “opted to seek their own medical attention”. Investigators were at the scene Saturday trying to “identify the suspects and whoever else was involved”, according to police spokesman Sgt. Ronald Harris.